The DS is certainly a versatile bit of kit. It's touch screen design and fast loading cartridge based software have made it the hand-held console of choice the world over. Thanks to the amazing popularity and versatility of the DS, software developers are finding new and interesting niche markets for non-gaming software on the console. One of the most popular new genres is the interactive cookbook. The DS can quickly access multimedia information and tutorials while you prepare a range of tasty foods. Are these new cookbooks simply a gimmick, or do they offer something genuinely useful and innovative over a simple traditional cookbook? Read our reviews to find out. Turn yourself into a master chef with your Nintendo DS! 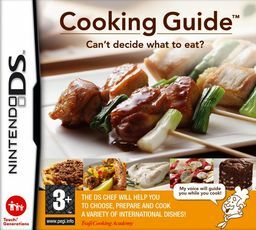 Nintendo were the first to exploit the DS's capabilities as an interactive cookbook with their popular title "Cooking Guide: Can't Decide What to Eat?" (known as Personal Trainer: Cooking in the USA). This interactive cookbook contains recipes from all over the world, along with tips, techniques and video clips. Did Cooking Guide get us salivating? You can find out in our Cooking Guide review. After the commercial success of Cooking Guide, several other interactive cookbooks were quick to appear on the market. Activision partnered with the popular English TV chef Jamie Oliver to produce "What's Cooking? Jamie Oliver". Can the TV super chef impress us with a serving of his unique cookery on the Nintendo DS? Find out in our "What's Cooking? Jamie Oliver" review. We're sure that there will be many more interactive cooking titles launched on the DS over time. Keep reading Lets-Play-DS.com and we'll let you know about other cooking titles that meet our high standards and perhaps a few that don't. Until then, happy cooking!